FOXCITY. Photo Booth – Me Time (Floral – Water Bath) @ Collabor88. FOXCITY. Detox Bento Friend Pose (Head towel and champagne included) @ Collabor88. Foxwood – Spa – Shelf @ Collabor88. Foxwood – Spa – Robe @ Collabor88. 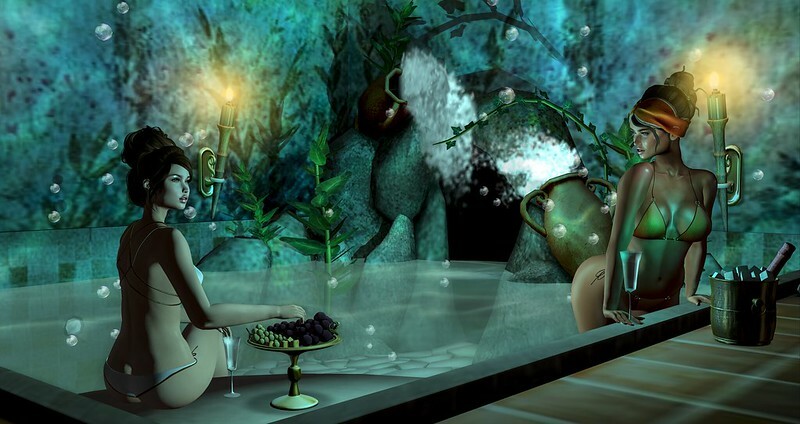 Tableau Vivant – Hairbase 10. 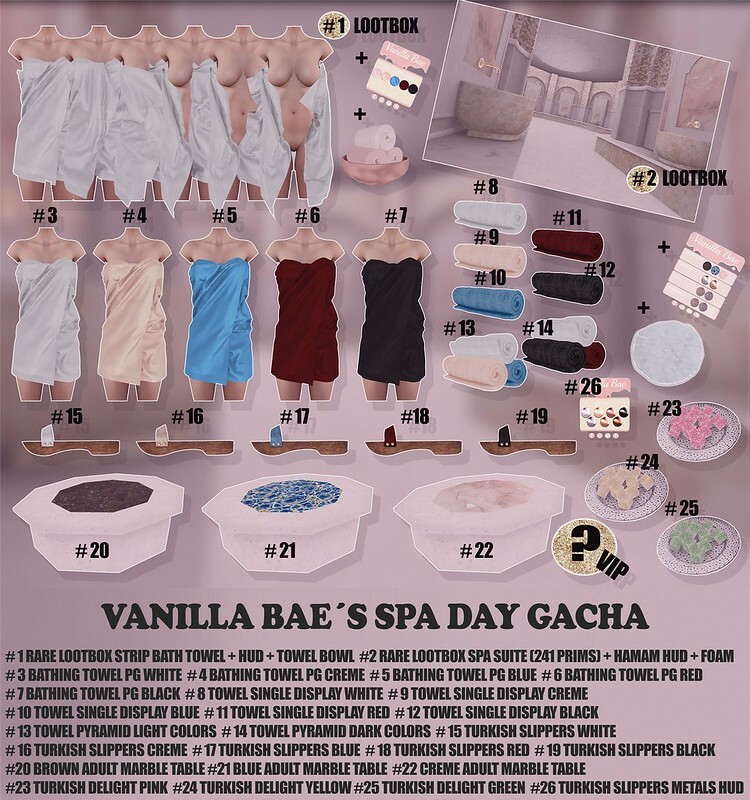 New *Vanilla Bae* Turkish Spa Day Gacha @ Lootbox. 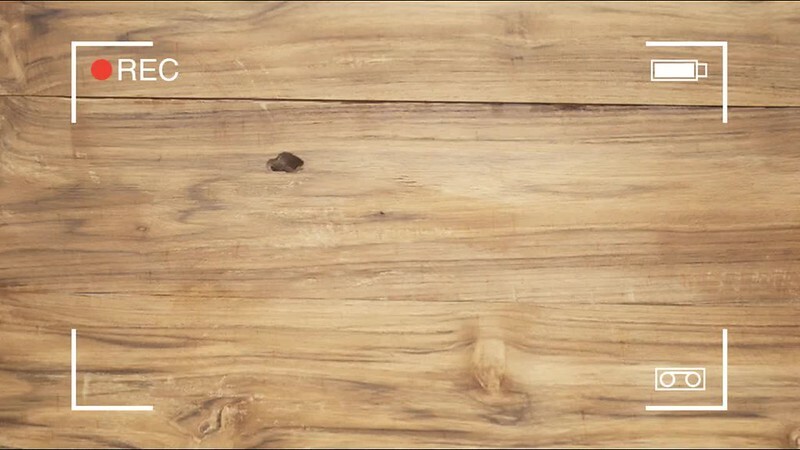 Erratic / amara – head towel / ivory (maitreya) @ mainstore. TRUTH / Apple / Whisps Rigged for Updo (slightly edited to fit towel) @ mainstore. K&S – // My sweet little weakness @ mainstore. My sweet sister Majka and I don’t get to spend as much time together as we’d like, but when we do it’s a blast. We decided to take a little day off from working, and have some girl time at the new Royal S.P.A. Suite by Astralia that will be at the upcoming The Arcade event on the 1st. See the shopping guide here: The Arcade – March 2018 Shopping guide. Our Spa Day started out with a lovely swim and chat at the grotto pool. After our swim, we decided to lounge in the spa area with some champagne and fruit. Time for showers and sauna, getting proper warmed through after a our swim. Now that we’ve treated our bodies well, one musn’t forget the face. Royal S.P.A. Suite by Astralia – coming on the 1st to The Arcade.